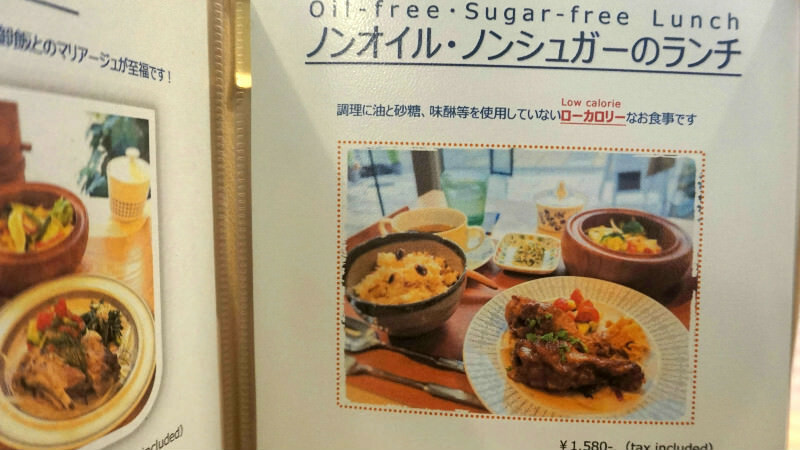 A unique Nordic style café serving non-oil non-sugar items located right underneath a symbolic Yasaka Pagoda. The chef focuses on using quality ingredients cooking without oil and added sugar. Bringing out all of the goodness from fresh ingredients, these dishes are wholesome, tasty, and satisfying. Toh no shita opened in June 9th, 2015 in the popular Kiyomizu area of Kyoto. Their opening day, 6/9 also pronounced as 6 (ro) 9(ku), is often referred to as “rock day”. As musicians, the owners bring music influences to the café with their collection of records from all over the world playing in the background through an antique English stereo. Another unique part of this café is the availability to choose your own cup from a wonderful collection of Scandinavian tableware that are also displayed for sale. Although this service is not available during busy lunch times, the experience of drinking out of your favorite cup is a real treat. A well rounded wholesome meal made with fresh ingredients. With the chef’s skills, the “umami” is brought out to the dish without using any oil or sugar. Not only this lunch is deliciously healthy, but also the variety of vegetables used is astonishing. The main dish consists of chicken drumettes braised with red wine and tomatoes. The side salad is fresh with added grapes for a nice touch. These dishes are reminders of how to enjoy food naturally without any unnecessary additives. Sweets without oil and sugar? It’s indeed possible. This delicious Finnish pancake contains eggs, milk, salt, flour, buckwheat, fruits, and nuts. The texture is like bread budding and has a slight sweet taste from the fruits. 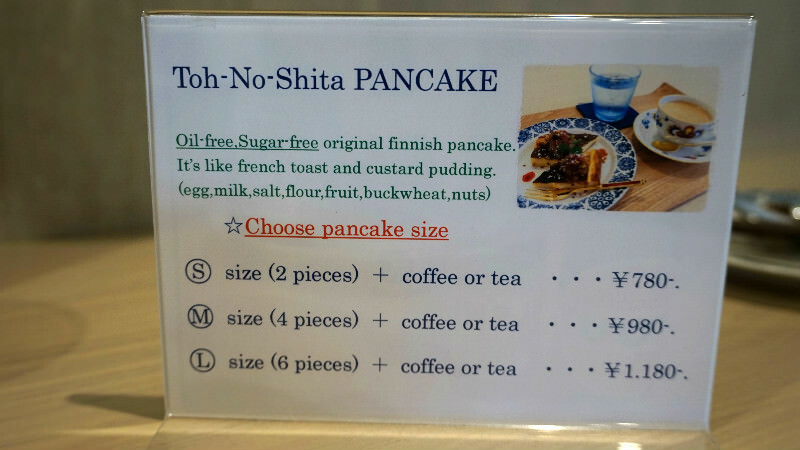 Toh no shita’s original Finnish pancakes can be enjoyed with coffee or tea. Choose the portion of pancakes from 2, 4, or 6 pieces. Toh no shita is an excellent place to sit back and have a tea time. Array of teas are available including herbal teas. Choose your favorite cup from the front of the store after ordering. The staff will carefully prepare the tea which takes about 10 minutes. A great experience especially for those who are collectors of tea cups. The Scandinavian bakeware are also for sale so be sure to check out their collection. These tea pot covers and coasters are their store original items assembled with fabrics that are used for Kimono. Not only the designs are charming, but the quality is top notch. Great for a gift, a set comes with a tea pot cover and a matching coaster for ￥4,280. There are several different choices for lunch set. Please refer the menu for photos. If all vegetarian meal is preferred, you can make the request when you order. Visit during cafe time (2:30pm~) in order to choose your choice of cup to enjoy your tea in. Toh no shita is not only a place to have a tea time or eat a great lunch, but it's also a place to appreciate Scandinavian tableware. I got to choose a really cute cup to drink my tea in. 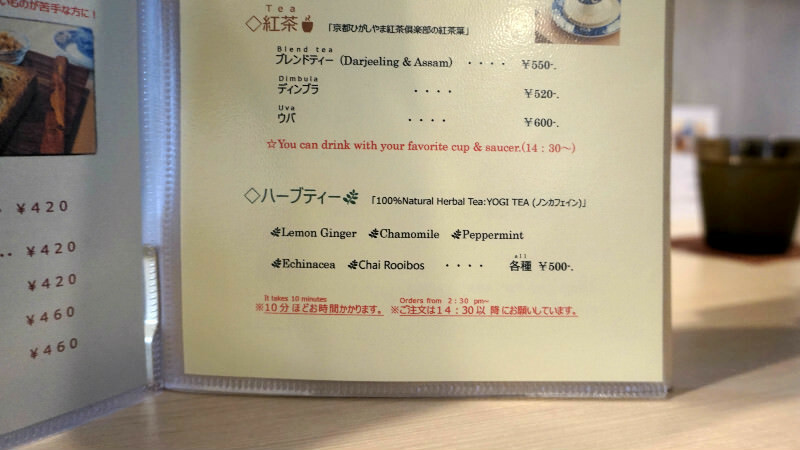 It was my first experience of that kind to be able to choose a cup. Tableware are also for sale so if you really like it, you could buy it to take home. The food was incredible and healthy! Most of the dishes are oil and sugar free but have a delicious impact. ・14-minute walk from Keihan train Gion Shijyo station ・1-minute walk from Kyoto city bus Kiyomizu michi stop. Scandinavian tableware displayed can be used for your tea order or can be bought to take home.